Let’s just imagine going for a bush walk in a national park, say five or ten years from now. As you set off on foot with your smart phone, selfie stick and water bottle, a tribe of kids and adults whiz past on mountain bikes. In the distance, you can hear the throaty buzz of trail bikes traversing the circuit reserved for them on the other side of the mountain. A kilometre or so down the track a herd of cattle cross the path to continue grazing along the stock route reserved for times of drought. Down in the gorge there’s a family of prospectors, panning for gold, while above, zip line riders scoot from tree to tree on overhead wires. There are kids swimming in the rock pool; they yell and wave to the 12 people riding horses while their guide (who once had a gig at the Sistine Chapel), holds a gaudy umbrella aloft so his charges do not stray. As you climb back up, a gondola glides silently overhead, taking punters on a cable car ride to a pricey restaurant and lookout at the summit. Back at the picnic ground, a dozen people are being given archery lessons while others queue for the hot air balloon tour. Some of that sounds OK. Fun, even. But in a national park? State governments are increasingly looking at new ways of increasing visitor numbers to the national parks and reserves under their control. In the pursuit of this goal they have embraced “ecotourism” which in its purest sense means: “Responsible travel to natural areas that conserves the environment and improves the well-being of local people”. People who frequently visit national parks to walk in the forest, birdwatch and just enjoy the peaceful seclusion had concerns about the Queensland Government’s decision to call for expressions of interest (EOI) for commercial projects in national parks. In Queensland, then Environment Minister Kate Jones raised the idea in 2008 and it was further advanced by the Newman government, which made changes to the Nature Conservation Act. It is clear the current Labor government is continuing along this path, although it has promised a review of the legislative changes to the Act made by the Newman government. National Parks Association of Queensland executive director Paul Donatiu says the key to the review is to ensure the cardinal principle for managing national parks is maintained. This means to provide, to the greatest possible extent, for the permanent preservation of the area’s natural condition and the protection of the area’s cultural resources and values (natural condition meaning protection from human interference). A spokesman for Queensland’s Parks and Wildlife Service said the previous government expanded management principles to include reference to education and recreation activities and ecotourism. We understand that 12 expressions of interest remain on the table, from more than 40 submitted, although only three are under active investigation. 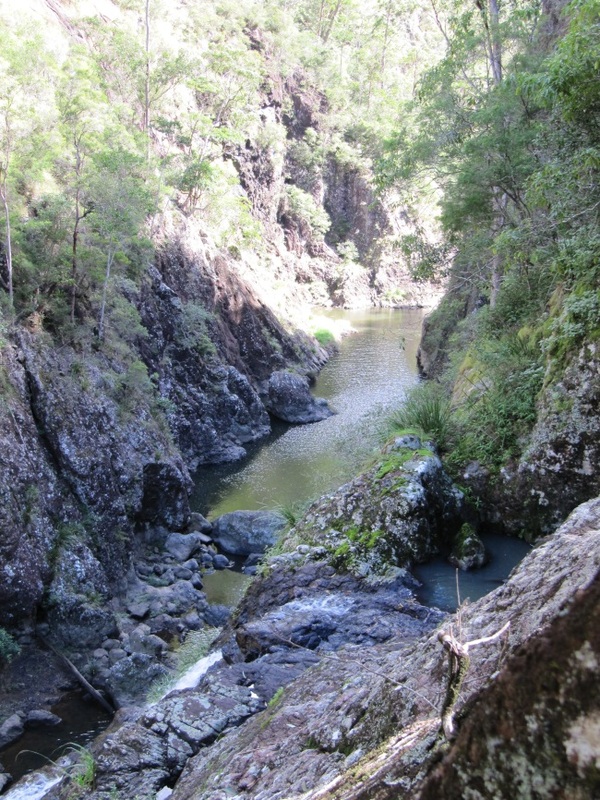 The spokesman confirmed that a zipline in the Obi Obi Gorge at Kondalilla National Park (pictured above) in the Sunshine Coast hinterland, was one of the projects identified by the government. The other is Green Mountains campground in Lamington National Park. The latter includes a campground, a three-bedroom house and a barracks building. The government is continuing to work with the proponent on this proposal. Details of other EOI proposals are “commercial-in-confidence” because they were initiated by the proponents. Paul Donatiu says the NPAQ is concerned about the precedent that would arise from allowing private use of public land. The NPAQ does not support commercial activities and says all of these proposals have the capacity to alter how we perceive national parks. Donatiu is particularly anxious about the zipline proposal because of the potential for interference with the forest canopy. Zipline Australia says its proposal minimises physical contact within the national park. Tour participants would enter the park on a suspension bridge from land outside the park then use cables and tree platforms to complete the journey. The tour infrastructure would be based in Montville, with participants bussed to the starting point. The Sunshine Coast Environment Council (SCEC) says it is “inappropriate and unnecessary” to locate a commercial, adrenaline- based development within a national park. SCEC spokesperson Narelle McCarthy said the group was concerned because of the high conservation and scenic values of the Kondalilla National Park. The Parks and Wildlife Services spokesman said the government is committed to partnering with the tourism industry to develop best-practice ecotourism experiences on national parks. There is nothing wrong with thrill-based tours like ziplines, rock-climbing, canyoning, abseiling or underground caving. These activities already occur in forest park environments all over the world. Not all tourists have the time or physical energy to take on a day hike to exotic locations, so they are happy to pay a premium to be transported, be it by tour coach (pick your destination), four-wheel drive (Fraser Island) helicopter (Fox Glacier, Grand Canyon) or cableway (Kuranda, Queenstown). Not everyone wants to visit a national park just to walk four kilometres, admire the view then walk back again. Many want another reason and that is what the ecotourism push is all about. The NSW Taskforce said competitors in other states and overseas had developed high quality nature tourism facilities and experiences in outstanding locations, many of which are in national parks and have multi-day walking activities with accommodation facilities. The Tasmanian government, for one, wants tourism operators to take advantage of development opportunities inside national parks and World Heritage Areas. In December 2014, 37 proposals were lodged, including one to build permanent, hut-style accommodation along the South Coast Track bushwalking route. The ABC’s 7.30 Report said the proponent believes numbers walking the track can be increased by up to 1,500 per year. An article in The Conversation a while ago put up an argument that national parks need visitors to survive. It quoted data from Australia, Canada, the US and Japan to show that national park visitor numbers were declining on a per capita basis. As Susan Moore and others wrote, if you are passionate about biodiversity and conservation, you need to convince more people to become advocates for national parks and conservation – to become frequent visitors. If you don’t, the interests that support utilitarian activities such as grazing, hunting and logging, may just get the upper hand. conservation, eco tourism, endangered species, National Parks. Bookmark. We need to remind Governments that there is privately owned land where ecotourism can exist. People who own land similar to National Parks need recognition and often income. After all they are paying the same Rates are people who graze and farm. In Australia and NZ – there is room for both. Our NPs are vast. Bob – except perhaps the stock routes. I think that is where you were leading to? Different story in much of Europe an the UK. I think an important consideration for any activity in a National park is not .. how much people will enjoy it and how much visitations will increase, but how much will the cost be? ?.National Parks are one of the few areas where our native wildlife has half a chance of surviving , let alone thriving. The disturbance to their needs .. to breed and to stay healthy with their natural food sources in tact is of prime importance. Too many are declining in number and their health being severely threatened. The Koala and the Tassie Devil are just two that we are all aware of. How many more that there are no studies that we know of? I live close to the proposed Zipline over the Obi Obi. One of the major concerns for me is the disruption to the forest and the resultant catastrophic invasion of weeds. We have long been ‘national park’ trippers and intensely interested and involved in the well being of our native animals. Before coming to live in the rainforest of the Blackall ranges we had NO idea of the huge battle it is to keep this area free of invasive, exotic weeds. With a vast diversity of birds, reptiles and mammals here, seed is spread in many ways. Once the canopy is ‘broken’ ..which the building of the Zipline will certainly do .. the invasion begins. Most of the weed species here, spread by wind, water, animals or suffocating vine growth are incredibly tough to control. If the building of the proposed zipline happens,the cost of weed management could be a disastrous consequence. I suspect that the cost to Government to contain this spread and preserve the integrity of this valuable Natural Park will exceed any financial benefits they may expect. Unless of course they have no intention of managing the National Park appropriately. Good for the Grand Canyon administrators. When I was there you could walk down to the bottom but if you got dehydrated and suffering from altitude sickness they’d send a chopper down for you (at your expense).